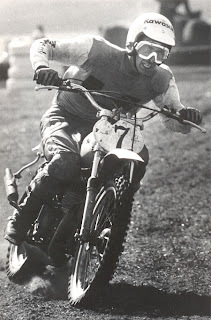 I was lucky enough to grow up watching motocross legends like Brad Lackey, Bob Hannah, Roger DeCoster, Heikki Mikkola, Jimmy Weinert and many others racing around the Southern California area. I rode in much, much lower classes on much, much slower bikes made by Benelli, Bultaco and Suzuki. But, I did have the all important Bell helmet and Preston Petty fenders that made me feel much faster. A few years later, names like Jean Michel Bayle, Doug Dubach and Guy Cooper, on much more modern motorcycles, were staging some of the most exciting Motocross racing to date. I don't want to take anything away from the excellent racing that is going on today, but to see those guys running true works bikes back in the early years was quite a sight. The smell of burning castor oil still brings a tear to my eye. Since 1947 riders from around the world meet to race in the Motocross des Nations. This not only pits the best racers in the world against each other, but attempts to find out which country was the fastest on dirt. It was actually a series of three races based on displacement. That race is still going on today, although the name has changed to Motocross of Nations. England and Belgium dominated in the early years, but now the U.S. has taken over, winning the majority of races since the inception. Because of the popularity of these legends of MX there is now a vintage version. The Motocross Vets des Nations will be run at Farleigh Castle in England. The date for this year is September 14-15, 2013. This splits up not only displacement, but year of bike with their corresponding technology (if you can call cable-actuated drum brakes and four inches of suspension travel out of twin shocks technology). This year, we have our own Guy Cooper, John Dowd, Doug Dubach and Shaun Kalos representing the United States in this classic. I know a lot of you are not going to be able to take a week off work to fly over to England and cheer our boys on. But at least let them know that we're standing behind them the next time you see them. I spoke with Guy Cooper before he left and he offered me the same story about our guys being on some inferior bikes, so they would just be out there having fun. I've known Guy for a number of years now and have heard that same story a few times before. Don't fall for it. He and the rest of our USA team will be out there riding like they were 20-somethings wanting to win as bad as ever. Now if you'll excuse me, I'm going to go raise the stars and stripess, burn some castor oil and have a beer.